Explore the mysterious temples and breathtaking landscapes of Cambodia and Laos on this 6 days tour through Indochina. From floating villages to towering ancient temples and mysterious, Buddha-filled caves this tour takes you deep into the wonders of these two beautiful countries. Price from: $691 - Book now! Day 1: Siem Reap – Arrival- Sunset over Angkor Thom. Welcome to Siem Reap, the provincial capital and gateway to the ancient Angkor Temples. Upon arrival, you will be picked up by our driver and tour guide for the warm greetings and hotel transfer. Time to refresh up. Later this afternoon, transfer by tuk tuk to Angkor Thom’s South Gate where you will see the beautiful and old Gate with its majestic doors and artifacts. Later, embark on a traditional wooden boat to cruise along the water moat by Angkor Thom. As your boat glides serenely along, watch the sunset over the majestic temples of the Angkor Archaeological Park. You’ll walk to one of the Prasat Chrung temples with your guide before returning to the boat and then to your accommodation in Siem Reap. Day 2: Siem Reap – Angkor Temples. After breakfast at the hotel, begin the day with a visit to the jungle-covered temple of Ta Prohm, a wonderful combination of human genius and natural beauty with its giant trees that have grown there for centuries. The temple became more famous after Tomb Raider was filmed there. Your next visit will be Banteay Srei, another must- see site and well known as the “women’s citadel”. This beautiful temple was built in 967 AD by Jayavarman V's guru, it showcases the most exquisite, deep and complex carvings in all Khmer architecture. After having lunch (your own account), explore Preah Khan meaning “Holy Sword”. This is one of the largest temple compounds in Angkor and is defended by four concentric walls. The main shrine and its adjoining buildings are richly decorated with Buddhist motifs and scenes from Hindu epics. Drive further through the North Gate of Angkor Thom to see the enigmatic faces of Bayon Temple, known as the heart of Angkor Thom. You will also see the intricate base reliefs of the Terrace of the Elephants before heading back to the hotel and the rest of time is at your leisure. 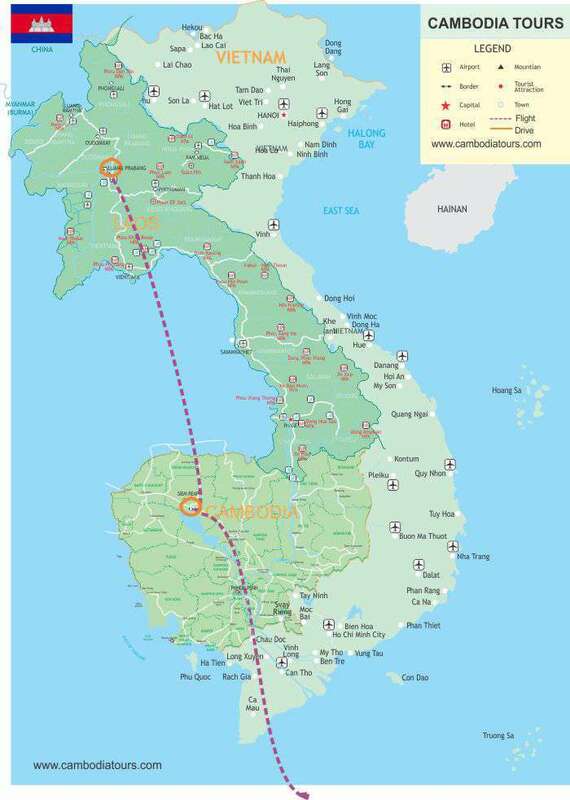 Day 3: Siem Reap – Angkor Wat – Roulous Group – flight to Luang Prabang. Wake early and transfer by tuk tuk to Angkor Wat complex - the largest religious monument in the world. Dawn is the most beautiful and haunting time to visit the temples and your trip value will be added when you see Angkor Wat reflex on the water. This is our way to avoid the crowd when they go back to their hotel for breakfast. Then, drive to the ancient capital of King Indravarman I (877-889), now referred to as the Rolous Group and known as the birthplace of classical Khmer art and architecture. Later of this day, transfer to airport for your flight to Luang Prabang. Upon arrival, you will be greeted and driven to the hotel for check in. Relax then. Following breakfast at the hotel, you will first visit the former king’s palace, which is now a museum. The many items nicely displayed include rare furniture, traditional costumes and arts, jewelry, ornaments as well as working tools and utensils of the early part of the 20th century. Then, drive out to Ban Xanghai, also known as the whisky village where the local make their wine lao lao from rice. Next, you will walk down to the pier to board a local motorized boat heading along Mekong to the mysterious Pak Ou caves exploring these mysterious caverns, filled with thousands of gold-lacquered Buddha images. Later, on the way back to Luong Prabang you will visit Ban Xieng Khong and Ban Xieng Lek which are very famous for making Saa Jute paper. On arrival in Luong Prabang late this afternoon, join us on a climb up to Phousi hill, the highest point in the area, to admire the panoramic view of the town at sunset. Transfer back to the hotel and enjoy your easy time afterward. In the evening, you can either relax in the hotel or explore the nearby Night Market on your own, where you can find an expansive collection of textiles, hand-woven by the local hill tribe people. Day 5: Luang Prabang – Morning city tour/ free afternoon. For the early risers, we suggest you should take the fantastic opportunity to watch or participate in the unique daily morning ritual, where hundreds of saffron-clad monks walk in procession collecting offerings of sticky rice from devout residents along the roadsides. After breakfast, join a half day city tour with us to explore the city’s main attractions. First, visit Wats Xieng Thong, the Golden City monastery, which dates back to the 16th century and is considered to be the finest in Laos. Continue to the morning Phosi Market where you will see such diverse offerings as dried buffalo skin, local tea and saltpeter among the chickens, vegetables and hill-tribe weavings. The afternoon is free. Perhaps, you may just relax at hotel or discover the city by yourself. Or, you may take part in one of the following activities with us. Please contact our travel consultant for more information and arrangement. - Trip to visit the local villages of Lao ethnic minority groups at Ban Ouay, Hmong Village, Ban Ou, Laoloum Village and Ban Thapene, Khmu Village, then drive to the beautiful Khouangsi Waterfall where you can cool off with a refreshing swim in the turqoise pools or walk along the forest trails. - Take part in Basi ritual ceremony (better arranged for the big group due to the cost). - The trip to the Ock Pop Tok. This is the Living Crafts Centre where the fascinating world of Lao textiles comes alive! Set in the grounds of a stunning tropical garden on the Mekong, it's the perfect place to learn more about this unique Lao art. - A half day with the mahout on the elephant ride exploring the countryside. - Experience for yourself the process of making rice – from seed to table on the half-day ‘Rice is Life’ interactive experience. After breakfast, you will have free time for doing what you wish until the transfer to the airport to catch your departure flight home. Note: Please be aware that flight time, hotels and all others logistics, services and days of travel are subject to availability. I have a conference from 24 - 27 January in Bangkok. I want to travel around Thailand, Cambodia, Laos and Vietnam before and after conference. Prefer a mixture of train, flights, bus and taxi travel. Total travel for approximately 15 days. I have just sent you details via your email. Please check it. We sent you the details via email. Please check it and let me know if you need any further information. I want to travel both to Cambodia and Laos this December 2018. I would prefer 5d/4n. We might be from 3-5 pax. How much would it cost including Air Fare. We are from Cebu City, Philippines. We well noted your message and will send you detail package via your email address. Please check it and let us know if you have any questions. Best Regards from Cambodia Tours Team!